Protecting Heroes is a program created by RE/MAX Service First broker and Owner John Gscheidmeier. As a former police officer, firefighter and teacher, John has always had a strong appreciation for those working in the public service sector. When John started the company he wanted to find a unique way to say ‘thanks’ to local Heroes who helped people every day. The Protecting Heroes program provides an easy way for us to say ‘thanks’ when a Hero buys or sells a home. In addition, We’ve assembled a large group of network partners who also provide discounts to Heroes on home-related services. How Do Heroes Save Money or Receive a Reward? When HEROES work with our real estate specialists or local businesses they receive HERO Rewards. How do Heroes Get Started In The Program? When Do Heroes Get Rewarded? 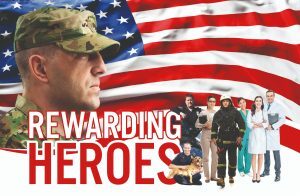 When buying and selling a home our Heroes receive their Reward immediately, unlike at other national programs that mail checks weeks later. We want your Reward in your hands at closing. ASK US about our network partners that can help you save money when getting a loan, refinancing, or contractors that provide discounts to our HEROES. Each office is independently owned & operated. If your are currently listed with another brokerage firm please disregard this advertisement.